Our 7-year-old son Fjord LOVES waffles, the problem is that he is also allergic to egg, not a good combination. A while ago my daughter Domi loaned us her waffle maker and I used it a few times. I use Orgran ‘No Egg‘ (available at Dischem) instead of eggs and the whole family loves them. We had great fun and added choc chips to the batter when they wanted choc chip waffles. It was not fair to keep Domi’s waffle maker indefinitely. 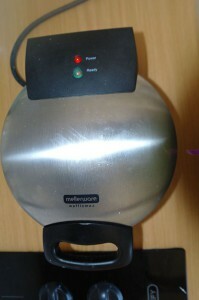 I saw a special offer on Kalahari for the Mellerware Wafflemax Waffle Maker and ordered it. Within a few short days Domi’s waffle maker was restored to her custody and we had our very own. Since taking ownership of the waffle maker, I have taken it along when visiting family in Durban and Cape Town. 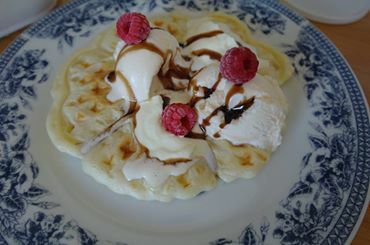 It’s great fun whipping up waffles for everyone and sharing the joy. Next I would really like to find a few ideas for savoury waffles and other variations. I’m thinking along the lines of bacon and cream cheese, or even egg and bacon. Please share interesting alternatives under the ‘comments’ section below. I am happy with choosing the brand Mellerware, the fact that all their appliances have a 2 year warranty goes a long way in my estimation. I bought the Mellerware Ma Baker bread machine in April and am still delighted with that. I have a recipe somewhere for Apple and cinnamon waffles. Very yummy. I’ll see if I can find it and leave a copy with Abbey for you.